when I got my Higher Peak altitude system. and cycling. I use this system extensively. more out of the training you already do. Make your hard work ﻿really﻿ pay off . delivery means more speed, endurance, and power. Be ready ﻿before﻿ you leave. from the Higher Peak Mountain Air Generator. conditions you will face, up to 20,000 feet (6000 m). Use the tables below to see how the effective amount of oxygen in the air varies at different altitudes. Although air contains 20.9% oxygen at all altitudes, lower air pressure at high altitude makes it feel like there is a lower percentage of oxygen. The charts are based on the ideal gas law equation for pressure versus altitude*, assuming a constant atmospheric temperature of 32 degrees Fahrenheit (0 Celsius), and 1 atmosphere pressure at sea level. 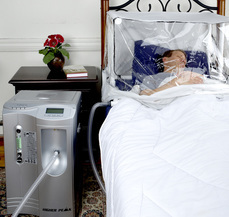 You can acclimatize to high altitudes in your own bedroom? Even at sea level? An altitude generator can produce varying oxygen levels from sea level (20.9% oxygen) to 20,000 feet to 6000 meters (9.5% oxygen). By breathing "rare air", you can pre-acclimatize before you leave home. You can climb, run, ski, or bike at high altitudes without altitude sickness and, because altitude creates new red blood cells, with more speed and endurance. Everest Conqueror Slept His Way to the Top! "Greetings from Gorak Shep (altitude 16,942 ft), last outpost before Everest Base Camp. My climbing partner and I have ascended quite rapidly and we have been track our blood oxygen concentration regularly. He is a fantastic climber who is more experienced than I am, but I have been consistently out-performing him on this metric, though he *lives* at 5200 ft and regularly trains at 9000 ft. Sleeping in the hypoxic tent every night the last two months has made a huge difference."